A Special 'Hello' to all my new subscribers! What a great bunch of new friends I make every day with this little project! Note: belt replacement on the 27” wide version of these dryers is quite a bit different. I hope to go over that in a later article, but I do have a very inexpensive ‘basic service manual’ available for immediate download that covers it, too. You’ll find it posted on the website. Then insert a putty knife in the gap between cabinet top and cab in front, and push back to release the retainer clips on each side. The top will lift, and you can swing it up and back, out of your way. Often you don't need the putty knife, but can just pull forward on the cabinet top and the clips will unhook. If yours has a separate bottom panel, remove it by either pulling on its top edge or using a putty knife to push the retainers, and swing it down. Then it'll lift off its bottom hooks. 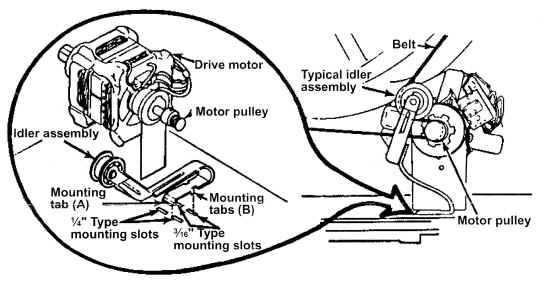 Roll the belt off the motor pulley and idler (note how the belt runs through the hole under the idler pulley and the idler hooks into the base). Unhook the door springs and set them aside. Keep an eye on the door - it'll want to fall down on your head at this point! Loosen the two 5/16" screws that the bottom of the front panel rests on. Then remove two screws from the inside that hold the front panel on, tip it forward, mark the door switch wire locations with a magic marker, and pull them off. Then lift the front panel off and set it aside. (Note: if yours is a newer model with a one piece front panel, just remove the two screws and lift the panel off its bottom clips. Once the front panel's off, the drum will lift up and come right out the front. Vacuum it out well and oil the rear drum rollers or replace them if their bearings are really worn and noisy, and also oil the idler pulley bearing (use a good grade of oil, sewing machine oil, ‘3 in 1’, etc - no WD-40, please!) - and put her back together. The routing of the belt around the idler pulley can be tricky on these the first time you do it, because it’s hard to picture. Loop the belt around the drum with the grooved side against the drum. Then, with the drum in place, install the idler into its slots in the dryer base. Slip a loop of the belt through the rectangular hole under the idler and roll the loop onto the motor pulley. It helps to have a helper holding the drum, but after you do this once or twice, you can hold the drum with your left knee while reaching back and doing this. The job’s a lot easier on older models with the separate bottom panel, because the panel holds the drum up for you. But I’m told these kinds of contortions are actually healthy, stretching out muscles that otherwise get little use. And who knows, Ringling Brothers may one day have an opening for this kind of work, so it pays to be prepared <grin>. Anyway, double-check that there's good strong airflow out the back before reconnecting the vent, then connect it and run it on 'fluff' with no heat, and go outside and double-check that the airflow outside is also good and strong. It's easy to kink the vent duct when you push it back, and this step will make sure all's well in the airflow department. Part number 4392065 is a nice money-saving repair kit for these machines, and includes not only a new belt, but also an idler, both drum rollers, and the necessary hardware. This kit is the most economical way to purchase these parts, and I'm really glad to see Whirlpool put the kits together. Costs much less than buying these parts individually, like we did before these were available. 2) Here’s something else I get a lot of questions about: testing refrigerator and freezer compressors. So let me go over the simple procedure I use whenever I run into one that’s ‘short-cycling’ (trying to start, clicking on/off every few seconds, or in some cases, every minute or two). Basically, using a digital ohmmeter, you pull the compressor's relay and overload off its three terminals, then check the resistance between each of these three pins. Older relays looked a bit different than the solid state one below, but pulled off pretty much the same way. Reading from that common to each of the other two, carefully note each reading. Then measure back across the two with the highest resistance, ignoring the common. That reading should be the exact total of the two individual coil readings, because you're reading through both coils in series now. If those two sets of readings aren't within about 1/2 ohm of each other, then one of the compressor windings is shorted, and if it runs at all, it'll run hot and usually end up short-cycling on its overload protector. The only solution, if that’s the case, is compressor replacement - a major job, and one I usually don’t recommend any more due to the expense. If the windings test OK, but it still won’t run, then I connect a test cord and try to run it manually. If I can’t start it that way, it’s most likely a mechanical problem, most often binding bearings, and the ‘bottom line’s the same: either the compressor or refrigerator will have to be replaced (I’ll be discussing test cord procedures, and how to make your own, in a future article). "If a nation won’t be ruled by God, it will be ruled by anarchy"